Something unexpected happened to me when I joined an online writing challenge last year. The rules of the challenge were simple: you’re given a writing prompt, a word count, and one month to come up with a story. On the due date, you submit your story and then you have to give feedback on at least four other writer’s submissions. I admit I was not thrilled about this last part. It wasn’t that I didn’t want to read other works, I enjoy that part. I just felt like I’m not qualified to critique other people’s writing because I’m not an editor. I almost backed out of the writing challenge because of this last requirement. Then I thought about it for a minute. I realized that I provide my own reviews on Goodreads of books I’ve read and told myself that this would be no different. So I jumped into the writing challenge with both feet. As I began critiquing other works, I started off noticing mechanical stuff: spelling errors, verb tenses, stuff like that. I felt like that wasn’t enough so I did some research on how to give a good critique. To my surprise there are tons of articles on the Internet about how to do this. I spent an entire week reading different articles about how to provide a good critique. Then I began applying what I learned. As I delved deep into other people’s stories I had an epiphany: learning how to critique their work was making me a better writer. It happened one day while I was stuck on the flow of a paragraph for a short story. I remembered a piece of advice that I gave to another writer. I used that same advice in my own writing and got unstuck immediately. So I sat and thought about this whole critique business and wondered how helping other people with their writing could be helping me with mine. I came up with a few things. By details, I don’t mean misplaced commas and spelling errors. When I really began getting into this whole critique thing, I started looking for the things that I learned in some online writing courses I took. Things like: showing and not telling; does the first line of the story grab the reader’s attention; believability; things like that. Then I began to pull out sentences or entire paragraphs to give suggestions for improvement. This really stretched me as a writer. I realized that a critique – a good one – isn’t just saying “good job” to the writer and moving on to the next story. That’s not helping the writer expand their skills. No, a good critique helps the writer see where their weaknesses are and gives some in-depth suggestions on how to improve it. People think writers are looking for pats on the back when we ask for feedback. Maybe some are, but a lot of us crave honest feedback on how to make our writing better. The publishing industry can be cold and cruel. You aren’t doing your writing friends any favors by telling them what you think they want to hear. As I began to read other stories I learned what moved me, what pulled me into a story and didn’t let go. Now I realize that this is a totally subjective viewpoint. Not too long ago, I was reading a book and I just could not get into it. Every page irked me. I had to stop reading to figure out what it was. When I shared what was irking me with the person who gave me the book, this person suggested that I put aside the personal experience I had that this book reminded me of and just read. After giving that suggestion some thought, I realized how ridiculous that statement was. When you read, no matter how much you may try not to, you are always reading through the lens of your personal experiences. There is no way around that. Every reaction we have to anything in life is filtered through life experience. So I realize that what I love about a story another person may hate. But here’s the thing: if you get feedback from multiple people and there’s one piece of that story that every reader loves, then you just learned a small piece of what makes readers tick. That’s why it’s important to get feedback from multiple people. Sometimes a piece of advice may just be bad advice. The only way to know for sure is to test it out with multiple readers. You know almost immediately if a book isn’t working for you. Sometimes the reason a passage isn’t working is glaringly obvious: the writing is clunky; the flow is off; too much exposition makes the writing feel forced. Other times something just niggles at you and you can’t put your finger on what isn’t working until you step away from it for a minute. Sometimes you figure it out and sometimes you don’t. Critiquing isn’t just about saying “that stunk.” Okay, I get that you don’t like it, but now tell me why. The only way I can make the story better is if you pull out a section of the story that didn’t work for you and give me specifics on where things went south. Otherwise I’m gonna question your motives. I’ve learned that some people are going to say they hate your work no matter what, and it’s usually because they are unhappy with their own writing and, well, misery loves company. I’ve found that when I had trouble connecting with a piece and I shared my insights with the writer, nine times out of ten they were struggling with that very same piece of the story. Instead of fixing the issue they forced something into the plot for the sake of moving the story along. 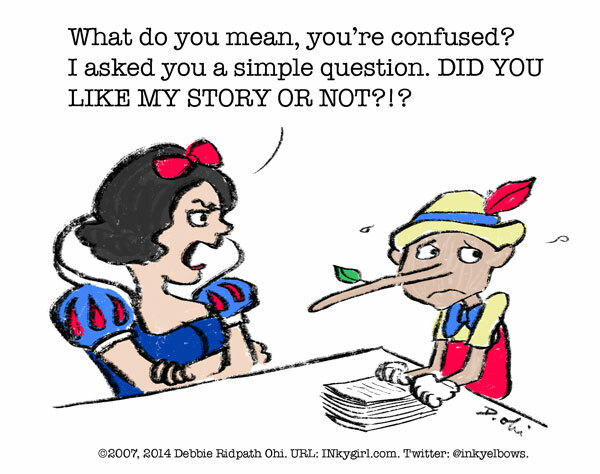 When you aren’t authentic in your writing, the reader can always tell. That’s a post for another day. Critique work is messy business. When someone provides suggestions on your work, you have to be willing to be open and listen to what people have to say. That’s hard. As writers, our stories are pieces of who we are and when someone says they don’t like something, it’s like saying they don’t like us. If you’re going to make it as a writer you must develop a thick skin. As I received critiques from other writers, I had to look closely at what they were saying about my stories. The bottom line is as a writer you can choose to use or not use the suggestions people make. But be sure to inspect your motives before you turn away a piece of advice. Remember what I said about stories running through people’s personal filters? Well, that’s always going to be the case. So when you get a piece of advice that doesn’t sit well with you ask yourself if the advice will add some depth to your story – or not. Then decide. But you have to be really honest here. And if multiple people say the same thing isn’t working, well then you know it’s not those pesky personal filters, but a mechanical flaw that’s janking your story up. (Yes, janking is a word I made up but it fits). If you’re serious about your writing, learning how to critique other people’s work is one of the most important skills you can develop. If you learn how to give a thorough and helpful critique, you’ll often discover your own weaknesses. When you do that, you have learned how to step away from your own work and be more objective (and you’ve begun to develop that thick skin you need as a writer). You’ll also form some really meaningful relationships with others in your craft. This is your tribe and their continued presence in your life will prove invaluable. Do you belong to a writing critique group? How has it helped you? Let me know in the comments!